Just came across this gem from the 90's and thought I'd tell you about it. 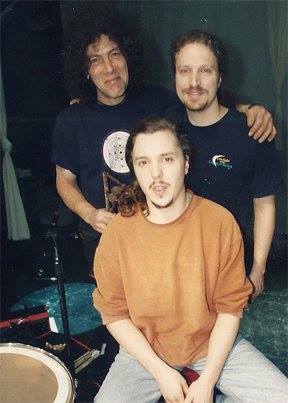 This was a quick photo shoot before one of our shows for Modern Drummer Magazine with Rusted Root percussionist Jim DiSpirito and our beloved friend/drumtech/babysitter Chris "Sunshine" Slemmer. Road crew guys are some of the hardest working people you'll meet. Often driving overnight, loading in early and loading out late. Yet, no matter how tired he was, Chris *always* had a smile for me. He was a constant calming presence and helped me feel like, no matter how intense things got, that he had my back.